Hurricane Harvey hit the Texas coast with an unforgiving fury. Wind gusts of more than 130 mph battered buildings when the storm made landfall on Aug. 25, and in the days that followed, many areas around Houston received more than 50 inches of rain. By the time the massive storm moved out of the area, roughly 450 square miles of Harris County were under water, and tens of thousands of people were displaced. For many of those storm victims, the discomfort of having to evacuate their homes was compounded by the not-knowing. With flood waters making it impossible to return home, they were left wondering whether there was anything to return to at all. 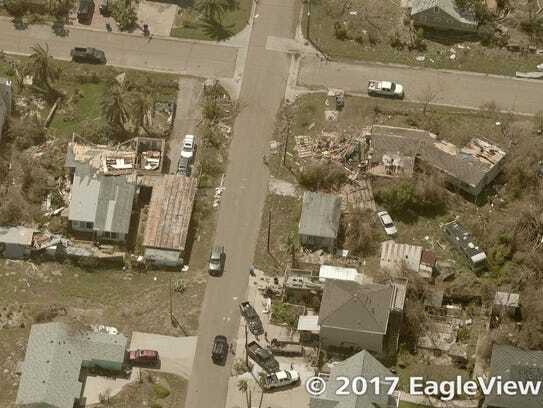 To help those victims, Henrietta-based EagleView Technologies launched a website to show aerial images depicting what Harvey left in its wake. Users can enter a street address to see before and after images side-by-side. These images, in some cases just hours old, show areas that have been impacted by flooding and the extent of damage caused by high winds. 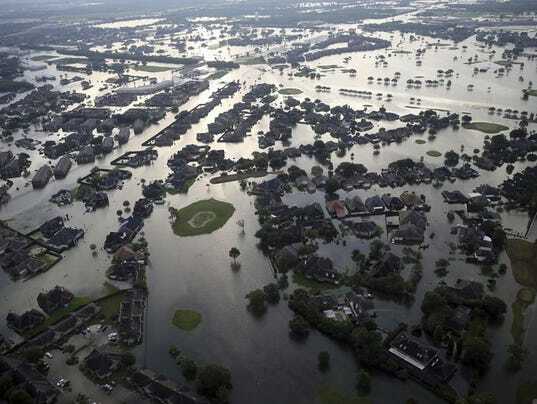 "We did something similar in 2008 for Hurricane Ike when that hit the greater Houston area," said Frank Giuffrida, vice president of engineering at EagleView. "Galveston Island was evacuated and basically shut off. FEMA didn't let folks back for several weeks." EagleView, formerly known as Pictometry, provides aerial imagery and data analytics for local and federal government agencies, most of which is captured by its fleet of planes equipped with specialized cameras and backed by powerful software. Over the years, the company has captured more than 350 million images, covering more than 90 percent of the most populated areas in the United States. They're capturing these images for their clients: state and local governments or insurance companies. In this instance, that work can also benefit the general public in a real and immediate way. "In this case, we have complete coverage of that whole Gulf Coast area," Guiffrida. That meant EagleView already had a library of "before" images, all captured within the last two years. For other major storms when they didn't have that coverage, like Hurricane Katrina in 2005, they could go out and capture it as the storm approached. It's a huge challenge, of course, to do aerial photography in the days just before or just after a major storm. The weather is only one of the challenges the pilots face. More difficult are the temporary flight restrictions that get put into place while the Coast Guard conducts search and rescue operations, or when Air Force One brings the president to town. "Planning and staging are a huge part of this process," Guiffrida said. "As soon as it becomes safe to fly, we'll be opportunistic about where we can go." EagleView deployed 22 planes to the Houston area in the days before Harvey hit, getting them pre-positioned based on where the impact was forecast to be most severe. They deployed a similar number to Florida as Hurricane Irma approached a week after Harvey, and they'll be prepared to deploy for other storms that follow. Once the worst of Harvey passed and conditions were safe, those planes in Texas took to the air and started capturing images. Within a few days, they had logged more than 350 flight hours and covered roughly 5,600 square miles, capturing about a million images. They're still flying, continuing to record conditions on the ground as they evolve. Pictometry was founded by John Ciampa, a former Rochester Institute of Technology professor, and Stephen Schultz, an RIT graduate. The company and the school have had a long partnership, and RIT's research in the field of aerial imaging has continued to push forward the boundaries of what is possible. Whether the images are captured by airplanes, remotely piloted drones, or satellites high above the earth, building a library of high-resolution images is just the first step. "Nobody cares about the pictures anymore," says RIT professor Carl Salvaggio. "A person or even a team of people can't look at a million images. We have to teach computers to look at those batches and tell us what's interesting." He and his colleagues at RIT's Digital Imaging and Remote Sensing Laboratory are doing just that. Whether it's evaluating the health of each plant in a cornfield or inspecting gas pipelines in remote areas, the images captured from above are just a means to an end. "When you talk to a utility company like RG&E, they don't want 8,000 images of power lines," Salvaggio said. "They want to know which poles have broken conductors or wires in need of repair." Computers use machine learning to do that, analyzing each of the images, understanding what each image shows, and kicking out a report for repair crews with the location of problem spots. Over the last decade, drones have become cheaper and the quality of pictures they take keeps improving. The weakest link? The humans who pilot them. "Pilots are not good at keeping the camera aimed straight down, at flying straight, at keeping a consistent altitude," Salvaggio said. "All of those things affect the quality of the images. That's why we're working on totally autonomous flight." Technology is already pretty good for having a drone fly itself from point to point. The goal would be to have a human launch a drone, have it recognize its surroundings and plot its own course. 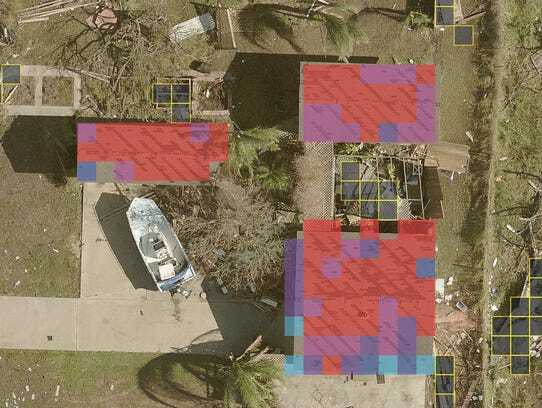 "To analyze storm damage, for example, we're teaching the camera to fly up to about 150 feet, begin to understand the geography of a rooftop, and build a 3-D model," Salvaggio explains. "Then it flies 10 feet above the building taking pictures." And within RIT's drone program is a specialty lab called IPLER — the Information Products Lab for Emergency Response. Researchers there have worked on projects to monitor forest fires and to assess flood and earthquake damage. After a massive event like Hurricane Harvey, insurance companies are going to be overwhelmed with calls from policyholders. One of the things that EagleView can do is create a heat map to identify the areas that have been hit the hardest. "They can't send claims adjustors to every home on day one," Giuffrida said. While they're doing that, machine learning algorithms can start the process of assessing damage on individual homes. In some cases, that can be done from images captured by manned aircraft. In other cases, they use drones, which can get much closer to the damaged structure. It's a service EagleView has been offering for several years, and they work with 18 of the top 20 property and casualty insurance carriers in the United States. They can kick out a report that assesses how much damage a homeowner has endured, and in many cases the imagery is sufficient to allowing adjusters to close claims without physically visiting the property. "Machine learning is relatively new technology," Giuffrida said. "It's going to become better and better with time." One of the other applications for this technology is property assessment. "An assessor doesn't have the bandwidth to visit every single home in a jurisdiction every year," Guiffrida said. Aerial imagery can capture 50,000 homes, compare it to images from a year earlier, detecting which ones have undergone significant changes.